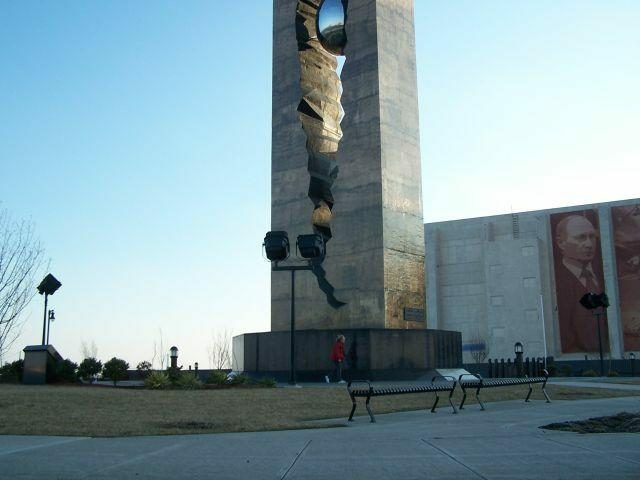 Photographs show a New Jersey monument to the victims of 9/11 that was donated by Russia. I had never heard of this before receiving it. Why didn’t the press report it? 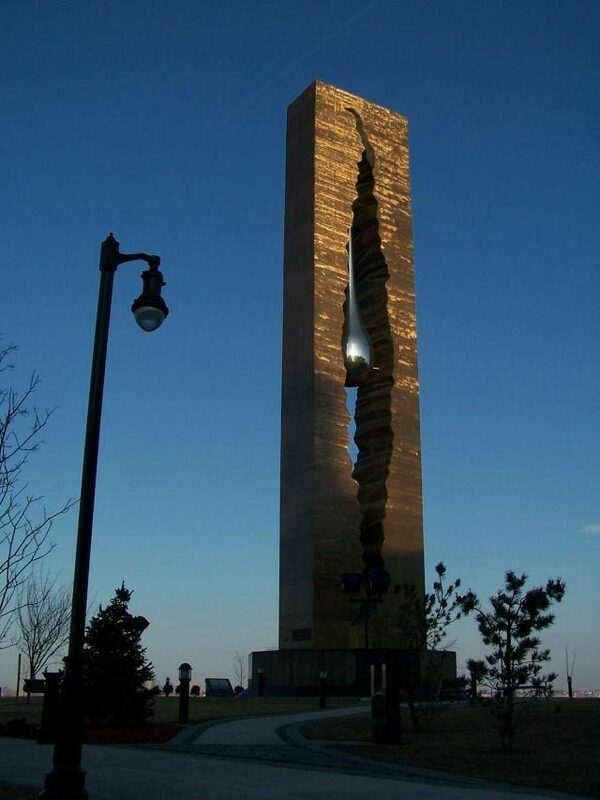 This is the “TEAR DROP” made and installed by the Russians to honor those who died in 9 11 and a statement against terrorism. It is very impressive. The tear drop is lined up with the Statue of Liberty. 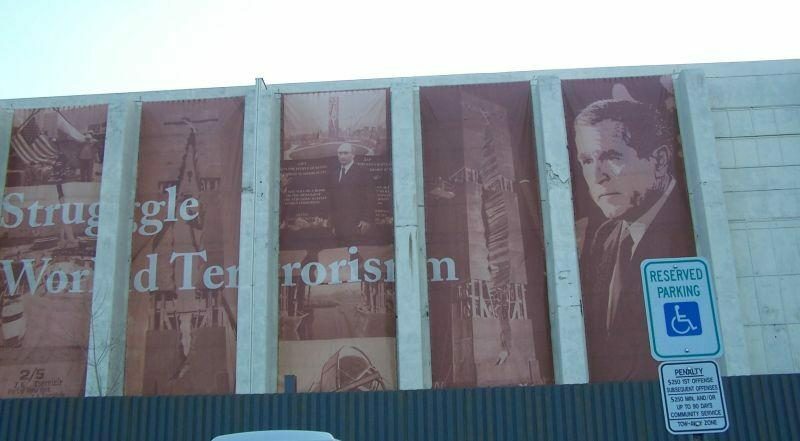 ….it is an impressive memorial and statement against terrorism. 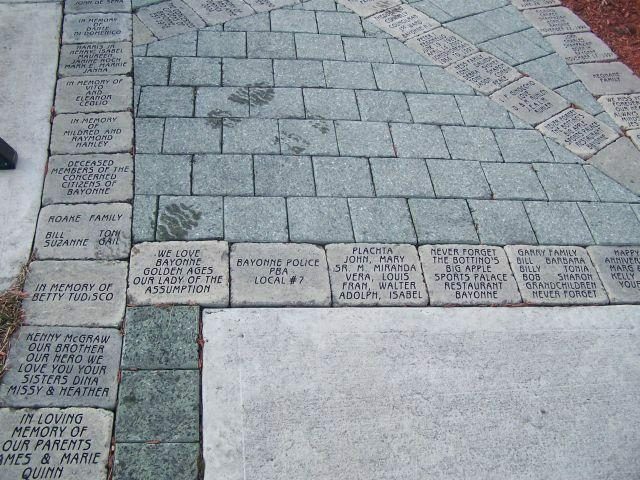 Names of the persons killed on 9 11 are inscribed on the base like the Vietnam Memorial wall. It was a cold and windy day but well worth the drive to see. It is down in the shipping yards across from “The Lady”. 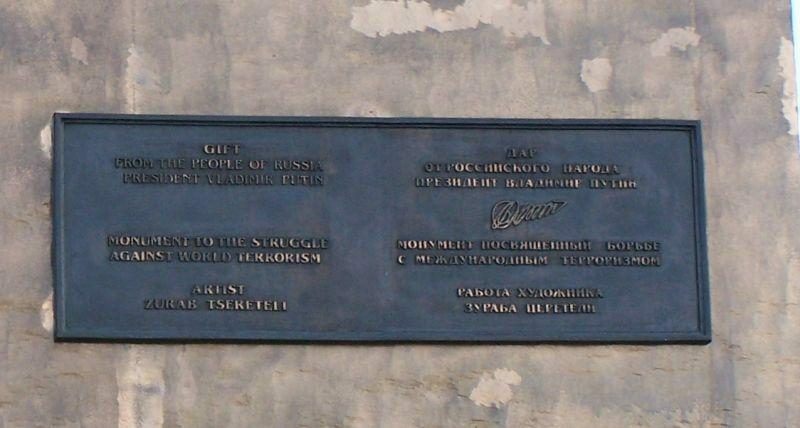 A gift from Tsereteli and the Russian people, the memorial is made of steel sheathed in bronze. Standing 100 feet high, its center contains a jagged tear. 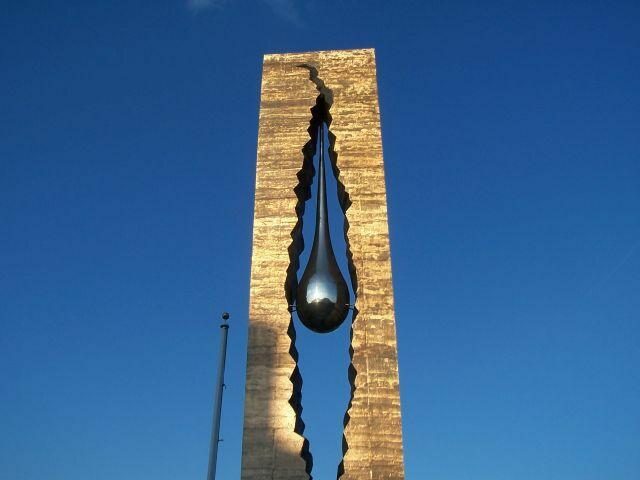 In it hangs a 40-foot stainless steel teardrop, representing sadness and grief over the loss of life, but also hope for a future free from terror. 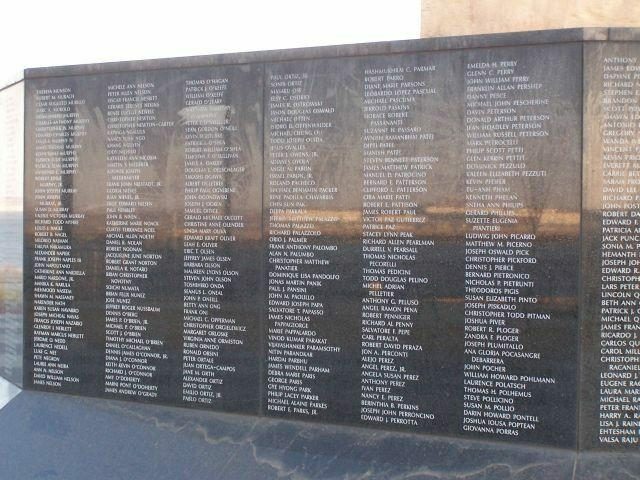 Etched in granite on an 11-sided base are the names of the nearly 3,000 killed in the 1993 World Trade Center bombings and terrorist attacks on Sept. 11, 2001. 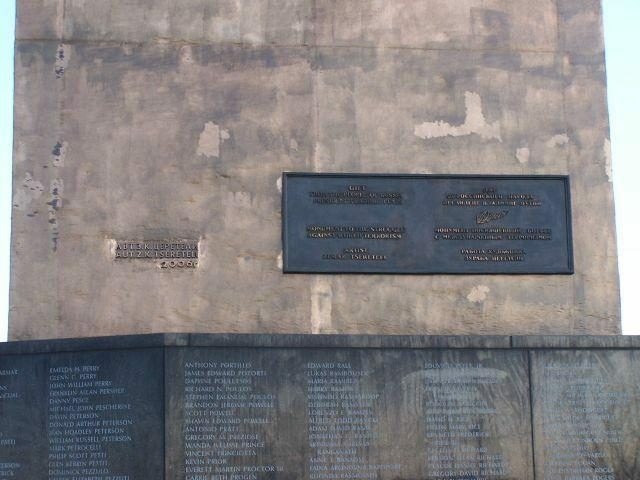 Photographs of the monument’s construction (as well as the finished version of the memorial) can be viewed at the 911 Monument web site. A portfolio of Tsereteli’s other works around the world is also available on The New Yorker‘s web site. The New York Times. 30 June 2004. The New Yorker. 25 June 2007. FOX News. 28 July 2006. The New York Times. 10 September 2006.